Engineered Designed Systems - Vacuum Vented Radiant Heating Systems. The Reflect-O-Ray 4.0" System has been proven to be a well designed vacuum radiant heating system. It's performance and design versatility has made it a valuable asset to the Reflect-O-Ray line up. We are proud representatives for this system and other systems that have been developed in the past. The powder coated burner & exhauster assemblies will withstand some of the harshest conditions around. Our radiant tubing is constructed entirely of corrosion resistant aluminized steel. All of Combustion Research Systems carry a three year warranty on components and 10 year warranty on our tubing. to the customers desired temperature. 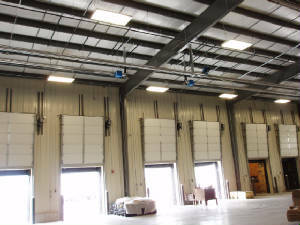 Heating with a Reflect-O-Ray infrared heating system, will save you 30-50% energy savings over unit heaters. will heat this warehouse to a comfortable level from the floor up. to the desired temperature and dries floors as it operates. 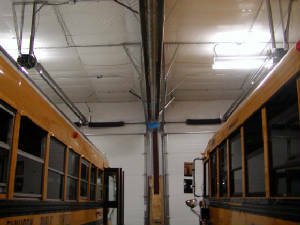 This 4.0" Reflect-O-Ray heating system uses a well built powder coated exhauster, shown here at the end of this system.